Friday, September 7, A.P.E.X. Events presents Space Debates! 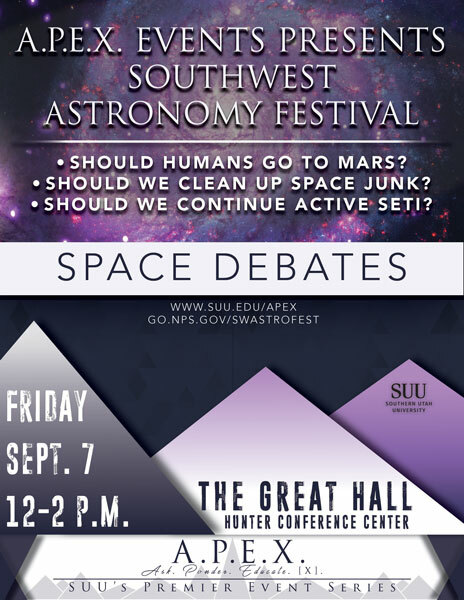 This event is in partnership with the Southwest Astronomy Festival and will feature a two-hour discussion of some of the hottest topics puzzling scientists about space and our interaction with it. Join us in The Gilbert Great Hall in the Hunter Conference Center at Noon on September 7 to hear the debates. This event is free and open to the public. Should we clean up space junk? Should we continue active SETI? 2018 marks the 2nd year of the Southwest Astronomy Festival. Other festivities will include sun parties, night hikes, solar telescope viewing, night sky photography, classes on bats, and learning how the human body is affected by space travel. Please visit their website to view a full schedule of events.